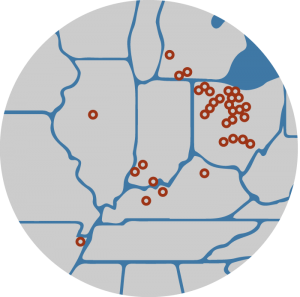 Pain Management Group welcomes six new partners and nine new providers across the country, launching its first centers in Indiana and Arkansas. A complete map of PMG’s current partner centers is pictured left. Great River Medical Center in Blytheville, Ark. will open doors to the Great River Pain Management Center on October 1, 2014. The center will be staffed by new provider Dr. Howard Bromley. Dr. Daniel Lynch will provide treatment to three new programs in Southern Indiana: Gibson General Hospital in Princeton, Ind. ; Perry County Memorial Hospital in Tell City Ind. ; and Daviess Community Hospital in Washington, Ind. All three Indiana hospitals are preparing to kick off the implementation process. Harrison Memorial Hospital in Cynthiana, Ky. and Twin Lakes Regional Medical Center in Leitchfield, Ky. are PMG’s second and third programs in the state. Dr. Heloise Westbrook will treat patients at Twin Lakes Regional Medical Center and at Muhlenberg Pain Management, PMG’s partner in Greenville, Ky. since 2013. Dr. Salah Eldohiri will begin seeing patients at Allegan General Hospital’s Pain Management Center when the program launches on September 15, 2014. Allegan General Hospital is located in Allegan, Mich. and is PMG’s second partner in the state. Dr. Arek Grochowski sees patients at the Pekin Pain Management Center, which launched September 9, 2014. Pekin Hospital in Pekin, Ill. is PMG’s first partner in the state. Dr. Javaid Malik will see patients at O’Bleness Pain Management Center in Athens, Ohio and Hocking Valley Pain Management Center in Logan, Ohio. Dr. Thad Nguyen will provide treatment at Fayette Pain Managment Center in Washington Court House, Ohio. Dr. Michael Rivera will staff the O’Bleness Pain Management Center in Athens, Ohio. Tom Judy, PA provides additional coverage with Dr. Will Hogan at the New Day Pain Management Center at Joint Township District Memorial Hospital in St. Marys, Ohio.